NASA’s Opportunity Rover is a special kind of vehicle. Not only did it set the record for longest distance driven on another world and discover the most compelling evidence for life on Mars thus far, it also surpassed its 90 day mission by a grand total of 3560 days, as of this past July 7th. In other words, the Opportunity Rover just celebrated its tenth anniversary, and people all over the world are marking the occasion by acknowledging the rover’s many contributions. These include discovering the first meteorite found outside of Earth, a temperature profile of the Martian atmosphere, and uncovering a series tiny, iron-rich spheres known as “blueberries” that hinted at a time when Mars had water. 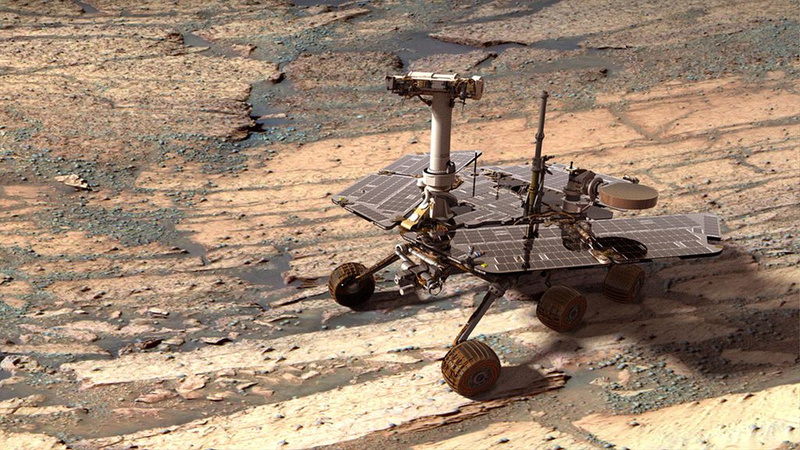 In fact, Opportunity’s most important discovery may have come just last month. 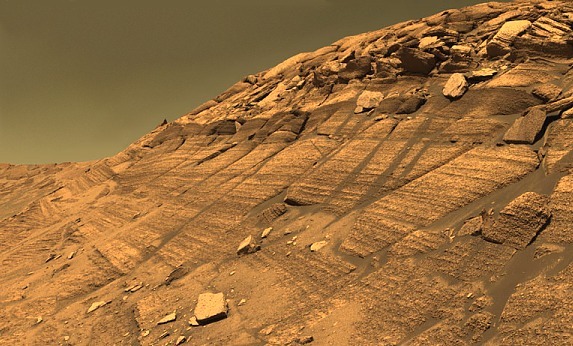 This consisted of a rock that proves that Martian water was once drinkable, which in turn suggests strongly that life could once have thrived there. On top of that, it captured some amazing photos, long before Curiosity was sending back its hefty batch of panoramas. But of course, Opportunity had its share of trials and tribulations as well. Foremost amongst these was the two months back in 2005 that it spent spent in a sand dune before its operators were able to wriggle it free centimeter by centimeter. And on the rover’s second day on Mars, it also experienced some shoulder joint problems, which proved to be the first of many, many mechanical problems. And yet, all of that seems worth it now. After being eclipsed by its larger, more recent arrival – the Curiosity Rover – Opportunity has battled back with its incredible longevity. Who’s to say how much longer the little rover that could will remain in operation? And who’s to say what it will uncover. At this rate, its doesn’t seem unlikely that it will beat its cousin to the punch of finding the Holy Grail – organic particles on Mars!